At Bartlesville High, the football Bruins will have another tough test against one of the state’s best for week No. 7 of high school football. BHS travels to Bixby to take on the No. 3 ranked Spartans on Friday night. The Bruins are coming off their best performance of the season last week with a two-point win over Sand Springs. Despite just a 1-2 start in district play, Bartlesville is still in the middle of a crowded playoff race for the third and fourth spots of the east-side district in 6A-II. 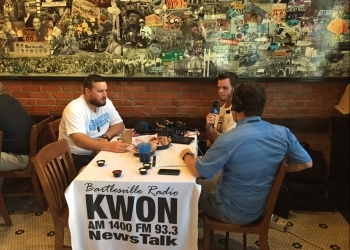 Wednesday night on his weekly radio show, Bartlesville head football coach Lee Blankenship talked about the playoffs. Bixby is undefeated in district play, and the Spartans are favored to run away with the district, they already own a 21-7 victory over Booker T. Washington. Despite being the underdog, Blankenship says his coaches are confident that if the Bruins play well, they’ll give Bixby a run for its money. Bartlesville at Bixby on Friday night, a 7:00 PM kick. We will have the play-by-play broadcast on KWON – AM 1400 and FM 93.3. We have the entire Lee Blankenship Show archived online HERE – as we talk Bruin football with coach Blankenship every Wednesday from 6-7 from Hideaway Pizza on KWON.